Billions of years ago, beings called the Guardians of the Universe use the green essence of willpower to create an intergalactic police force called the Green Lantern Corps. They divide the universe into 3600 sectors, with one Green Lantern per sector. One such Green Lantern, Abin Sur of Sector 2814, defeats the malevolent being Parallax and imprisons him in the Lost Sector on the desolate planet Ryut. In the present day, Parallax escapes from his prison after becoming strengthened by an encounter with crash survivors who had accidentally fallen into the dugout where Parallax was imprisoned on the abandoned planet. Parallax feeds on their fear to gain strength before pursuing and nearly killing Abin Sur, who escapes and crash-lands on Earth where he commands his power ring to find a worthy successor. Hal Jordan, a cocky test pilot working at Ferris Aircraft, is chosen by the ring and transported to the crash site, where the dying Abin Sur appoints him a Green Lantern, telling him to take the lantern and speak the oath. Jordan says the oath and is whisked away to the Green Lantern Corps home planet of Oa, where he meets and trains with veteran Corps members Tomar-Re, Kilowog, and Corps leader Sinestro, who believes he is unfit and fearful. Jordan, disheartened by his extreme training sessions and Sinestro's doubts, quits and returns to Earth, keeping the power ring and lantern. Scientist Hector Hammond is summoned by his father, Senator Robert Hammond, to a secret government facility to perform an autopsy on Abin Sur's body under the watchful eye of Amanda Waller. A piece of Parallax inside the corpse enters Hammond, giving him telepathic and telekinetic powers at the cost of his sanity. After discovering that he was chosen for the secret work only due to his father's influence and not for his own abilities, Hammond attempts to kill his father by telekinetically sabotaging his helicopter at a massive party. Jordan saves the senator and the party guests, including his childhood sweetheart Carol Ferris. Later, at the government facility, Hammond uses telekenisis to successfully kill his father by burning him alive. Hammond also elevates Waller high above the floor. As she's falling, Jordan arrives and saves the injured Waller by creating a pool of water which whisks her away out of further danger. During the encounter Jordan learns of Parallax coming to Earth. On Oa, the Guardians tell Sinestro that Parallax was one of their own until he desired to control the yellow essence of fear, only to become corrupted. Arguing that the way to fight fear is with fear itself, Sinestro requests that the Guardians forge a ring of the same yellow power, preparing to concede Earth's destruction to Parallax in order to protect Oa. Jordan appears and tries to convince the Guardians that fear will turn the users evil if its power is used, but they reject his pleas, and he returns to Earth to try to defeat Parallax on his own. Jordan saves Ferris from Hammond after a brief showdown. Parallax arrives, consumes Hammond's entire life force, and then wreaks havoc on Coast City. After a fierce battle, Jordan lures Parallax away from Earth and toward the sun. Parallax is inadvertently caught in the sun's gravitational pull and is destroyed, while Jordan escapes. Jordan loses consciousness after the battle and falls toward the sun, but is saved by Sinestro, Kilowog, and Tomar-Re. The entire Green Lantern Corps congratulates Jordan for his bravery. Sinestro tells Jordan he now bears the responsibility of protecting his sector as a Green Lantern. In a mid-credits scene, Sinestro takes the yellow ring and places it on his finger causing his green suit and eyes to turn yellow. Cast of Green Lantern at the 2010 San Diego Comic-Con International. A test pilot for the Ferris Aircraft Company whose will to act qualifies him to become the first earthman ever inducted into an intergalactic peacekeeping force fueled by green energy of will. Reynolds said, "I've known about 'Green Lantern' my whole life, but I've never really followed it before. I fell in love with the character when I met with Martin Campbell". Reynolds called the film "an origin story to a certain degree, but it's not a labored origin story, where the movie begins in the third act. The movie starts when it starts. We find out Hal is the guy fairly early on, and the adventure begins". Alternatively Chris Pine and Sam Worthington had been in discussions for the role. Bradley Cooper, Jared Leto and Justin Timberlake were other top contenders, while Brian Austin Green, a Green Lantern fan, campaigned for the part, but ultimately did not audition. Gattlin Griffith portrays a young Jordan. The vice president of Ferris Aircraft and a long-time love interest of Hal Jordan. One pseudonymous writer citing unnamed sources said Lively was among five leading contenders that included Eva Green, Keri Russell, Diane Kruger and Jennifer Garner. About her stunt work in which she rehearsed with stunt coordinator Gary Powell (Casino Royale, The Bourne Ultimatum, Quantum of Solace), gymnastic acrobats from Cirque du Soleil and used aerial stunt rigs created for The Matrix, Lively explained, "Our director likes it real—the fights close and dirty... I'm 40 feet in the air, spiraling around. That's the best workout you can ever do because it's all core... You do that for ten minutes and you should see your body the next day! It's so exhilarating, so thrilling—and nauseating". Jenna Craig portrays a young Ferris. A scientist who is exposed to the yellow energy of fear from Parallax, which causes his brain to grow to an enormous size and grants him psionic powers. Regarding his preparation for the role, Sarsgaard stated, "I actually did hang with this biologist from Tulane that was I think just the most eccentric guy they could find. He was entertaining, and he and I actually worked on my lecture that I give in [Green Lantern]." About his character Sarsgaard remarked, "He's got shades of gray. It's eccentricity on top of eccentricity". Kennon Kepper portrays a young Hammond. A Green Lantern and Hal Jordan's mentor. Strong affirmed that the film will follow the origin story, "the film closely follows the early comics. Sinestro starts out as Hal Jordan’s mentor, slightly suspicious and not sure of him because obviously Hal is the first human being who’s made into a Green Lantern. He's certainly very strict and unsure of the wisdom of Hal becoming a Green Lantern". Strong said, the character "is a military guy but isn't immediately bad. It's the kind of person that lends himself to becoming bad over the course of the comics being written, but initially he’s quite a heroic figure." He also revealed that the outfit and other aspects of the character very closely follow the character's early days, "That widow's peak and thin mustache was for some reason originally based on David Niven... So I would like to do justice to the Sinestro that was conceived for the comic books". A former congressional aide and government agent. About the differences between the comic book and film character Bassett said, "Well, I’m not 300lbs," but added that her character does have "that intellectual, that bright, that no-nonsense, that means business [personality]. [She's] getting it done and in the trenches nothing fazes her". A United States senator and the father of the movie's human villain, Hector Hammond. A Green Lantern who crash lands on Earth and recruits Hal Jordan as his replacement. Morrison said it took four to five hours to put on the prosthetic makeup for the character. About filming with Ryan Reynolds, Morrison commented, "We did the whole scene together where I give him the ring, our suits are CGI so we had these grey suits with things on them so it was cool and working with Martin Campbell again was great too". A bird-beaked member of the Green Lantern Corps who teaches Hal Jordan how to use his cosmic powers. Rush stated he was not initially familiar with Green Lantern but was drawn to the part after seeing the concept art explaining, "When I got the offer for it I said, ‘Haven’t they made that film?’ They said, ‘No, it’s a completely computer-generated character.’ I saw the artwork and I said, I would love to be that guy. Because I had voiced an owl in Legend of the Guardians: The Owls of Ga'Hoole and I’d voiced a pelican in Finding Nemo and I thought I could really improve on that now by being half-bird, half-fish, part lizard. You don’t get to do that in a live-action film." Rush compared the role to previous roles where he played a mentoring figure, "You could say that I’ve mentored Queen Elizabeth I as [Sir Francis] Walsingham, and [Leon] Trotsky has mentored Frida Kahlo and now Tomar Re is going to mentor Hal Jordan, and I was sort of mentoring King George VI in The King's Speech. But I can’t imagine Tomar Re setting up an office on Harley Street in London. They’re all very different people to me, but there is a kind of theme I suppose". A drill sergeant trainer of new recruits for the Green Lantern Corps. About the character, Duncan, a fan of the comic book, stated, "He's a real type of tough guy who knows everything, and actually in one of the comic books he and Superman fought to a tie". An Inuit engineer at Ferris Aircraft. Waititi said he was cast after a Warner Bros. casting agent saw his performance in Boy, which he also wrote and directed. Waititi – who has a Jewish mother and Maori father – says the production "had an opening for a role in the film for someone who wasn't, I don't [know], not-white or not-black." An entity made up of the yellow energy of fear, Parallax was imprisoned by Abin Sur after breaking into the physical plane by possessing the body of a former Guardian of the Universe. Additionally, Jon Tenney plays Martin Jordan, Hal Jordan's father; Jay O. Sanders portrays Carl Ferris, an aircraft designer, and father of Carol Ferris; Mike Doyle is cast as Jack Jordan, Hal Jordan's older brother; and Nick Jandl is cast as Jim Jordan, Hal Jordan's younger brother. In early 1997, Warner Bros. approached cult filmmaker and comic book writer Kevin Smith, who had then just finished writing Superman Lives, to script a Green Lantern film. Smith turned down the offer, believing there were more suitable candidates to make a Green Lantern film. At one point, Quentin Tarantino was offered the chance to write and direct. Warner also considered the property as an action comedy; by 2004, Robert Smigel had completed a script which was set to star Jack Black in the lead role. However, the studio dropped the comedy idea following poor fan reaction from the Internet. David S. Goyer was offered the chance to write and direct either a Green Lantern or Flash film after Warner Bros. was impressed with his screenplay for Batman Begins, but he opted to direct the latter. Actor-writer Corey Reynolds, a comic book fan of the John Stewart character, pitched Warner an idea for a trilogy, with him starring as John Stewart and performing screenwriting duties. Reynolds intended to introduce Hal Jordan, the Green Lantern Corps and Justice League in possible sequels. He finished the script for Green Lantern: Birth of a Hero in June 2007, receiving positive feedback from Warner Bros. with a potential 2010 release date. However, the studio abandoned Reynolds' concept, and in October 2007, Greg Berlanti signed to direct the film and co-write it with comic-book writers Michael Green and Marc Guggenheim. A draft of the trio's 2008 script, leaked on the Internet, revealed a story that included the hero's origin and included the characters Carol Ferris, Kilowog, Sinestro, and Guy Gardner in a cameo appearance, and appeared "to set up Hector Hammond as Hal Jordan's ... first major nemesis...." Shortly afterward, Guggenheim said that the script would contain characterizations inspired by the Denny O'Neil-Neal Adams run on the comic in the 1970s, and Dave Gibbons' work in the early 1980s. He added that he and his co-writers also looked to the 2000s Geoff Johns stories, saying, "It’s been interesting because we finished a draft just before [Johns'] 'Secret Origin' [story arc] started up. "So I’ve been reading 'Secret Origin' with a real interest in seeing 'OK, how did Geoff solve this problem?' There are certain elements just for anyone trying to retell Hal’s origin for a modern day audience has to address and grapple with. For example, why the hell was Abin [Sur] flying in a space ship when he's a Green Lantern? You don't ask that question back in the Silver Age, but when you're writing in the Modern Age, you have to answer these things." By December 2008, the writers had written three drafts of the screenplay and Warner was preparing for pre-production. However, Berlanti was forced to vacate the director's position when Warner Bros. attached him to This Is Where I Leave You, and in February 2009, Martin Campbell entered negotiations to direct. The release date was set as December 2010, before being moved to June 17, 2011. Bradley Cooper, Ryan Reynolds, Justin Timberlake, and Jared Leto were the producers' top choices for the starring role in July 2009. On July 10, Warner announced that Reynolds had been cast as Hal Jordan/Green Lantern. A website reported on January 7, 2010, that a crew-member had written on her blog that the film was greenlit the day before and that filming would begin in 10 weeks. Also in January, Blake Lively was cast as Carol Ferris, Peter Sarsgaard was in negotiations to portray Hector Hammond, and Mark Strong was in negotiations to play Sinestro. In February, Tim Robbins joined the cast as Senator Hammond. The following month, New Zealanders Temuera Morrison and Taika Waititi had joined the cast as Abin Sur and Tom Kalmaku, respectively. School bus marked with Green Lantern's fictional "Coast City" used in a shot in the Carrollton section of New Orleans, July 2010. New Orleans Lakefront Airport's Art Deco Terminal Building used as set for Ferris Aircraft headquarters, May 2010. With a production budget of $200 million, Green Lantern was initially scheduled to begin filming in November 2009 at Fox Studios Australia. The start date was pushed back to January 2010, but the production moved to Louisiana, where, on March 3, 2010, test footage was filmed in Madisonville involving stunt cars. Principal photography began on March 15, 2010 in New Orleans. Nine days after filming began, Angela Bassett joined the cast as Dr. Amanda Waller, a government agent who is a staple of the DC Comics universe. In April 2010, Jon Tenney revealed that he would play Hal Jordan's father, test pilot Martin H. Jordan. By June 2010 filming had begun at New Orleans Lakefront Airport. In the same month it was reported that Mike Doyle has been cast for the role of Jack Jordan, the older brother of Hal Jordan. In July 2010 it was reported that Ryan Reynolds was injured while shooting scenes for the film, separating his shoulder and was in "lots of pain". While promoting Deadpool (in which Reynolds portrays another famous comic book superhero), Reynolds said that filming Green Lantern itself had been frustrating, "You really need a visionary behind a movie like that, but it was the classic studio story: "We have a poster, but we don't have a script or know what we want; let's start shooting!" The Deadpool film refers to Reynolds' time as Green Lantern in two scenes, the opening scene which features a drawing of Green Lantern, and a later scene where his character (who has the ability to Break the fourth wall) insists that his suit not be "green, or animated!" In the film's sequel, there is a post-credits scene in which Deadpool travels back in time to shoot Reynolds before he can make the film. Geoff Johns confirmed that the film had ended principal photography on August 6, 2010 and entered post-production. In an interview with MTV News, director Martin Campbell was asked about the film's effects-heavy epic scale and commented "It's daunting, just the process, (there are) something like 1,300 visual shots, it's mind-blowing, quite honestly". When asked about the constructs created from the power rings, Campbell stated "One of the nice things is, we'll all sit down and say, 'Well, what are we going to do here?' Really, it's as much as your imagination can go to make the constructs". The studio also confirmed that the film would have a 3-D release. In January 2011, it was reported that Green Lantern had begun re-shoots for key scenes at Warner Bros. Studios in Los Angeles, California. In March 2011 it was reported that Geoffrey Rush had joined the cast as the voice of the CGI-created character, Tomar-Re. In April 2011, Michael Clarke Duncan entered negotiations to voice Kilowog. Also in April it was reported that Warner Bros. raised the visual effects budget by $9 million and hired additional visual effects studios to bolster the ranks of the team that had been working overtime to meet the film's June 17 launch. The soundtrack was released in stores on June 14, 2011. The soundtrack was composed by James Newton Howard, who also worked on the other Warner Bros/DC Comics based films Batman Begins and The Dark Knight with Hans Zimmer. The soundtrack was published by WaterTower Music. 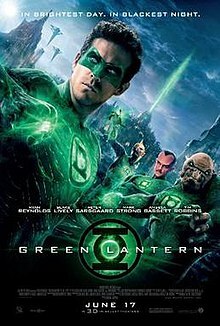 The world premiere of Green Lantern took place on June 15, 2011 at Grauman's Chinese Theatre in Hollywood, California, and was released in North America and the UK two days later on June 17. Green Lantern was released on DVD and Blu-ray on October 14, 2011. The Blu-ray release includes an extended cut, which adds an extra nine minutes of footage to the running time, totaling 123 minutes. Marketing and promotion of the film cost $100 million. The first footage of the film was shown at the 2010 San Diego Comic-Con. The footage was widely released online in November 2010 with thirty seconds of footage airing the following day on Entertainment Tonight. The first full theatrical trailer for the film was shown before screenings of Harry Potter and the Deathly Hallows - Part 1 and became available online in November 2010. This initial trailer was met with a poor reception from fans and, as a result, the film's marketing campaign was delayed. Sue Kroll, the studio's worldwide marketing president stated, "Part of the reason the response to the first trailer was lukewarm was that the big-scale sequences weren't ready to show, and we suffered for it. We can't afford to do that again." In April Warner Bros. debuted nine minutes of footage at the 2011 WonderCon in San Francisco. The Hollywood Reporter reported that the footage wowed the audience. A four-minute cut of the WonderCon footage was later released online. In March 2010, Comics Continuum reported that an animated Green Lantern film was in the works at Warner Bros. Animation and would be part of a direct-to-video project that was timed for release of the live-action Green Lantern movie in the summer of 2011. The Green Lantern animated project would likely take a look at the origins of the Green Lantern Corps, including the first ring wielders. In an interview with Bruce Timm, the producer revealed that a sequel to the Green Lantern animated movie had been discussed but cancelled because of the picture not achieving the immediate success that they had hoped for. However, Timm did hope the live-action film would renew interest in a sequel. The animated movie entitled Green Lantern: Emerald Knights was officially announced in June 2010 instead. DC Entertainment began releasing a series of Green Lantern Movie Prequel comics the week before the film was released, covering the lives of the characters before the events of the film, written by members of the film's production team. Five comics were made, covering Tomar-Re by Marc Guggenheim, Kilowog by Peter J. Tomasi, Abin Sur by Michael Green, Hal Jordan by Greg Berlanti and Sinestro by Michael Goldenberg and Geoff Johns. A free excerpt of the Sinestro prequel comic was released online as "Secret Origin of the Green Lantern Corps #1" two days before the release of the film. Six Flags debuted two roller coasters named Green Lantern at Great Adventure and Magic Mountain in 2011 to coincide with the film's release. A third ride, Green Lantern Coaster, also opened in November of the same year at Warner Bros. Movie World in Australia. Although this ride was more based on the original comic. Warner Bros. Interactive produced a tie-in video game, Green Lantern: Rise of the Manhunters, for the PlayStation 3 and Xbox 360 by Double Helix Games, with versions for the Nintendo Wii, the Nintendo DS and the Nintendo 3DS by Griptonite Games. Green Lantern opened on Friday, June 17, 2011 in North America, earning $3.4 million in 1,180 midnight runs. The film went on to gross $21,386,523 its opening day, but fell 22% on Saturday for a weekend total of $53,174,303, earning it the No. 1 spot. In its second weekend Green Lantern experienced a 66.1% decline, which was the largest second weekend decline for a superhero film in 2011. Green Lantern grossed $116,601,172 in the U.S. and Canada as well as $103,250,000 internationally bringing its worldwide total to $219,851,172. Many industry analysts felt that Green Lantern "failed to perform to expectations". The Hollywood Reporter speculated that Green Lantern needed to make approximately $500 million to be considered financially solid. Green Lantern received negative reviews from critics. Rotten Tomatoes gives the film an approval rating of 26% based on 236 reviews with an average rating of 7.4/10. The site's critical consensus reads, "Noisy, overproduced, and thinly written, Green Lantern squanders an impressive budget and decades of comics mythology." On Metacritic, the film has a score of 39 out of 100 based on reviews from 39 critics, indicating "generally unfavorable reviews". Audiences surveyed by CinemaScore gave the film an average grade of "B" on an A+ to F scale. Justin Chang of Variety gave Green Lantern a mixed review, stating, "Martin Campbell's visually lavish sci-fi adventure is a highly unstable alloy of the serious, the goofy and the downright derivative." Manohla Dargis of The New York Times wrote, "Green Lantern is bad. This despite Ryan Reynolds's dazzling dentistry, hard-body physique and earnest efforts, and the support of fine performers like Peter Sarsgaard ... Mark Strong ... and Angela Bassett". Christy Lemire of the Associated Press called it a "joyless amalgamation of expository dialogue and special effects that aren't especially special." Roger Ebert of the Chicago Sun-Times had mixed feelings, stating, "Green Lantern does not intend to be plausible. It intends to be a sound-and-light show, assaulting the audience with sensational special effects. If that's what you want, that's what you get." British newspaper The Daily Telegraph named The Green Lantern one of the ten worst films of 2011. Conversely, Todd McCarthy of The Hollywood Reporter gave it a positive review, saying the film "serves up all the requisite elements with enough self-deprecating humor to suggest it doesn't take itself too seriously". Reviewer Leonard Maltin felt that "the film offers a dazzling array of visual effects, a likable hero, a beautiful leading lady, a colorful villain, and a good backstory. It also doesn’t take itself too seriously." Kenneth Turan of the Los Angeles Times wrote, "More science-fiction space opera than superhero epic, it works in fits and starts as its disparate parts go in and out of effectiveness, but the professionalism of the production make it watchable in a comic book kind of way". In 2010, director Martin Campbell confirmed the possibility of a Green Lantern trilogy. Warner Bros. originally planned on Green Lantern being the first entry of a new DC film franchise, and commissioned a script for a sequel from Greg Berlanti, Michael Green, and Marc Guggenheim while filming for the first film was underway. In August 2010, Michael Goldenberg was still attached to write the screenplay, based on the sequel treatment. The scene in the film's end credits showing a resurgence of the yellow power ring of fear, with Sinestro becoming corrupted by its dark power, teased the planned sequel. In September 2011 Warner Bros., dismayed by the film's negative reviews and disappointing box office run, abandoned plans for sequels. In June 2013, David S. Goyer confirmed that Man of Steel is the first film in the DC Extended Universe. This confirmed that should the Green Lantern property be featured in an upcoming DC film, it will be a rebooted version. Later that year Goyer stated that he had interest in making a new feature film based on the titular character. In July 2015, Warner Bros announced plans to release a solo Green Lantern film titled Green Lantern Corps, with a release date scheduled for June 19, 2020. The film will be the eleventh installment of the DC Extended Universe. John Stewart and Hal Jordan will reportedly be the Green Lanterns focused on in the movie. In January 2016, it was reported that Goyer and Justin Rhodes will be writing the film's script and will also produce the film, with Geoff Johns and Jon Berg as executive producers. The disappointing performance of the film is occasionally a target of mockery from superhero-related comedies. Deadpool 2's post-credits scene features Deadpool, who is also portrayed by Ryan Reynolds, time-traveling to kill his own actor as he was reading the script for the Green Lantern. DC animated film Teen Titans Go! to the Movies also makes a reference to Green Lantern's disappointing film. ^ a b c "Green Lantern Box Office". Box Office Mojo. Archived from the original on July 17, 2011. Retrieved August 3, 2017. ^ a b Fritz, Ben (March 29, 2011). "Warner Bros.' 'Green Lantern' marketing campaign delayed by special-effects work". Los Angeles Times. Archived from the original on July 5, 2011. Retrieved June 15, 2011. ^ McNary, Dave (January 15, 2010). "Mark Strong Lights up 'Green Lantern'". Variety. Retrieved March 16, 2010. WebCitation archive. ^ Fischer, Russ (October 15, 2014). "Warner Bros Massive DC Movie Slate Revealed". Retrieved September 6, 2016. ^ a b c d Fleming, Mike (July 10, 2009). "Ryan Reynolds is the 'Green Lantern'". Variety. Archived from the original on January 4, 2010. Retrieved July 15, 2012. ^ "Exclusive Ryan Reynolds On Green Lantern's Costume And Deadpool's Debut". MTV News. November 25, 2009. Archived from the original on July 4, 2011. Retrieved March 16, 2010. ^ "Exclusive: Ryan Reynolds Says 'Green Lantern' Won't Be A 'Labored Origin Story'". MTV News. November 30, 2009. Archived from the original on July 4, 2011. Retrieved March 16, 2010. ^ Warmoth, Brian (April 2, 2009). "Rumored 'Green Lantern' Star Chris Pine Doesn't Have Part, Hasn't Read Script". MTV News. Archived from the original on July 4, 2011. Retrieved April 3, 2009. ^ Newgen, Heather (May 13, 2009). "Sam Worthington Talks Terminator, Avatar and Titans". ComingSoon.net. Archived from the original on July 4, 2011. Retrieved May 13, 2009. ^ Grieser, Andy (July 11, 2009). "Ryan Reynolds cast as 'Green Lantern'". Zap2it. Archived from the original on May 21, 2013. Retrieved June 7, 2012. ^ Sanchez, Robert (April 3, 2009). "Exclusive: Brian Austin Green on Fathom, The Sarah Connor Chronicles and Green Lantern". IESB. Archived from the original on July 4, 2011. Retrieved July 12, 2009. ^ Belloni, Matthew; Kit, Borys (April 17, 2012). "Jason Reitman Casts Child Star for Next Film 'Labor Day' (Exclusive)". The Hollywood Reporter. Retrieved December 14, 2018. ^ a b "Green Lantern Gets His Carol Ferris". SuperheroHype.com. January 8, 2010. Retrieved March 16, 2010. . WebCitation archive. ^ "El Mayimbe" (pseudonym) (December 9, 2009). "Exclusive: One Of These Five Lovely Ladies WILL Be Hal Jordan's Girlfriend!". Latino Review. Archived from the original on July 4, 2011. Retrieved March 17, 2010. ^ Bowles, Hamish (May 19, 2010). "Surf Deity Rob Machado Teaches Vogue's Hamish Bowles and Blake Lively How to Catch a Wave". Vogue. Archived from the original on July 4, 2011. Retrieved May 20, 2010. ^ Sciretta, Peter (March 24, 2010). "Angela Bassett and Gattlin Griffith Join Green Lantern". /Film. Retrieved December 14, 2018. ^ a b Kit, Borys (January 12, 2010). "Peter Sarsgaard to play "Green Lantern" villain". The Hollywood Reporter via Reuters. Archived from the original on June 1, 2012. Retrieved May 31, 2011. CS1 maint: BOT: original-url status unknown (link). .
^ Warmoth, Brian (August 16, 2010). "'Green Lantern' Villain Says His Greatest Fear Was A Single Word". MTV News. Archived from the original on July 4, 2011. Retrieved May 20, 2010. ^ a b "'Green Lantern' Director Says Mark Strong In Talks to Play Sinestro, Confirms Kilowog, More!". MTV News. January 15, 2010. Archived from the original on March 12, 2010. Retrieved March 15, 2010. CS1 maint: BOT: original-url status unknown (link). .
^ Truitt, Brian (April 6, 2010). "Mark Strong will channel his inner David Niven for 'Green Lantern'". USA Today. Archived from the original on July 4, 2011. Retrieved April 7, 2010. ^ a b McNary, Dave (March 24, 2010). "Angela Bassett joins 'Green Lantern' cast". Variety. Archived from the original on July 5, 2011. Retrieved March 25, 2010. ^ Eisenberg, Eric (April 16, 2011). "Angela Bassett Talks About Playing Dr. Amanda Waller In Green Lantern". Cinema Blend. Archived from the original on July 4, 2011. Retrieved May 12, 2011. ^ a b "Tim Robbins Cast in 'Green Lantern'". TheWrap.com. February 9, 2010. Archived from the original on April 20, 2013. Retrieved June 6, 2011. CS1 maint: BOT: original-url status unknown (link). .
^ a b "Kiwis Score Superhero Roles". TVNZ. March 16, 2010. Archived from the original on March 23, 2010. Retrieved June 6, 2010. CS1 maint: BOT: original-url status unknown (link). .
^ Chavez, Kellvin (May 24, 2010). "Exclusive: Temuera Morrison Talks Green Lantern". Latino Review. Archived from the original on July 4, 2011. Retrieved June 1, 2010. ^ a b Boucher, Geoff (March 30, 2011). "Geoffrey Rush joins the Green Lantern Corps". Los Angeles Times. Archived from the original on July 5, 2011. Retrieved March 30, 2011. ^ Cornet, Roth (May 8, 2011). "Interview: Geoffrey Rush Talks 'Green Lantern' & 'Pirates 5′". Screen Rant. Archived from the original on July 4, 2011. Retrieved May 19, 2011. ^ a b Kit, Borys (April 12, 2011). "Michael Clarke Duncan to Voice Kilowog in 'Green Lantern'". The Hollywood Reporter. Archived from the original on April 14, 2011. Retrieved April 13, 2011. CS1 maint: BOT: original-url status unknown (link). .
^ Marshall, Rick (May 18, 2011). "Michael Clarke Duncan Explains Why It Was 'Easy'". MTV News. Archived from the original on July 4, 2011. Retrieved May 18, 2011. ^ Bloom, Nate. "Interfaith Celebrities: Kyra Sedgwick, Baseball's Braun-y Interfaith Rookie and a Jewish Maori Director", InterfaithFamily.com, July 10, 2007. WebCitation archive. ^ Moraitis, Andrew (August 20, 2010). "Boytown". News Hit. Archived from the original on July 4, 2011. Retrieved August 20, 2010. ^ a b Huver, Scott (April 11, 2010). "Exclusive: Jon Tenney is Green Lantern's Dad". Superhero Hype!. Archived from the original on July 5, 2011. Retrieved April 16, 2010. ^ Gunn, Elston (May 14, 2000). "Elston Gunn interviews Kevin Smith". Ain't It Cool News. Archived from the original on July 5, 2011. Retrieved June 14, 2011. ^ Eric Ditzian (December 2, 2009). "Exclusive: Quentin Tarantino Was Offered 'Green Lantern'". MTV Splash Page. Retrieved September 17, 2014. ^ Carroll, Larry (November 21, 2007). "Jack Black Green With Envy Over New Lantern". MTV. Archived from the original on July 5, 2011. Retrieved June 14, 2011. ^ Marshall, Rick (December 15, 2010). "Jack Black Recalls His Brief Time As 'Green Lantern' Star". MTV. Archived from the original on July 5, 2011. Retrieved June 14, 2011. ^ Clint Morris (December 18, 2004). "Exclusive Interview : David Goyer". Moviehole. Archived from the original on February 6, 2008. Retrieved July 26, 2009. ^ Melrose, Kevin. "The Closer co-star wants to pitch Green Lantern film". Newsarama. Archived from the original on May 23, 2013. Retrieved July 15, 2012. ^ "Corey Reynolds is a superstar on 'The Closer,' maybe a superhero as well?". USA Weekend. Archived from the original on February 8, 2013. Retrieved July 15, 2012. ^ Bader, Marlon (June 18, 2007). "The 'Closer' co-star wants to pitch 'Green Lantern' film". Richmond Times-Dispatch. ^ Fleming, Michael (October 28, 2007). "Berlanti lights up 'Green Lantern': WB set director for DC Comics adaptation". Variety. Archived from the original on November 16, 2010. Retrieved October 29, 2008. CS1 maint: BOT: original-url status unknown (link). .
^ Seijas, Casey. "'Green Lantern' Script A Fanboy Dream Come True? ", MTV.com, 2008-08-15. WebCitation archive. ^ Phegley, Kiel (October 14, 2008). "Marc Guggenheim Drops The Comics That Inspire Green Lantern's Screen Debut". MTV News. Archived from the original on October 18, 2008. Retrieved October 30, 2008. CS1 maint: BOT: original-url status unknown (link). .
^ Vineyard, Jennifer (December 1, 2008). "'Green Lantern' Co-Writer Marc Guggenheim On Casting Superman's Cameo And Script Changes". MTV News. Archived from the original on February 20, 2009. Retrieved February 25, 2009. CS1 maint: BOT: original-url status unknown (link). .
^ Fleming, Michael (February 4, 2009). "Campbell in talks for 'Lantern'". Variety. Archived from the original on June 5, 2011. Retrieved February 25, 2009. CS1 maint: BOT: original-url status unknown (link). .
^ "Green Lantern and Sucker Punch Moved to 2011". SlashFilm.com. May 7, 2009. Retrieved May 7, 2009. . WebCitation archive. ^ a b c Weintraub, Steve (July 9, 2009). "Update: Justin Timberlake, Ryan Reynolds, or Bradley Cooper Will Star in Green Lantern". Collider.com. Archived from the original on June 21, 2011. Retrieved July 9, 2009. CS1 maint: BOT: original-url status unknown (link). .
^ "Green Lantern Gets the Official Green Light". SuperheroHype.com. January 2010. Archived from the original on June 18, 2010. Retrieved March 16, 2010. CS1 maint: BOT: original-url status unknown (link) . ^ Bulbeck, Pip (April 16, 2009). "Green Lantern to shoot in Sydney". The Hollywood Reporter. Archived from the original on April 19, 2009. Retrieved April 16, 2009. ^ "Lake Road closure planned in Madisonville due to movie work". Nola.com. March 2, 2010. Archived from the original on July 5, 2011. Retrieved March 15, 2010. ^ Keyes, Rob (March 4, 2010). "Green Lantern Production Begins Today!". Screen Rant. Archived from the original on July 5, 2011. Retrieved March 15, 2010. ^ "Behind the scenes of Green Lantern". WGNO. June 8, 2010. Archived from the original on July 5, 2011. Retrieved March 29, 2011. ^ "Ryan Reynolds Injured on Set of Green Lantern". US Magazine. July 14, 2010. Archived from the original on July 5, 2011. Retrieved July 15, 2010. ^ McGloin, Matt. "Ryan Reynolds Reflects Green Lantern; Deadpool Makes Fun". cosmicbooknews. ^ "Geoff Johns (2010-08-06)". Twitter. July 6, 2010. Archived from the original on July 5, 2011. Retrieved August 6, 2010. ^ Wigler, Josh (November 2, 2009). "'Green Lantern' Director Discusses Intergalactic And Earthbound Shooting Locations". MTV News. Archived from the original on July 5, 2011. Retrieved March 15, 2010. ^ Marshall, Rick (February 3, 2010). "'Green Lantern' Director Describes The 'Constructs' Created By Hal Jordan". MTV News. Archived from the original on July 5, 2011. Retrieved March 15, 2010. ^ "'Green Lantern' Will Receive 3-D Release". MTV News. March 4, 2010. Archived from the original on July 5, 2011. Retrieved March 15, 2010. ^ Filipponi, Pietro (January 6, 2011). "Green Lantern Movie Currently Undergoing Re-Shoots in Los Angeles". The Daily Blam!. Archived from the original on July 5, 2011. Retrieved January 7, 2011. ^ Cohen, David (April 26, 2011). "Biz battles crunch on tentpole vfx". Variety. Archived from the original on July 5, 2011. Retrieved April 26, 2011. ^ "Green Lantern". Archived from the original on July 5, 2011. Retrieved May 27, 2011. ^ "Green Lantern Los Angeles World Premiere Wednesday, June 15, 2011". CNBC. June 6, 2011. Archived from the original on July 5, 2011. Retrieved June 14, 2011. ^ "Geoffrey Rush joins the Green Lantern Corps". The Independent. March 31, 2011. Retrieved August 12, 2012. ^ Liam Goodwin. "Warner Bros. sets October 14th release for Green Lantern on DVD and Blu-ray". Filmonic.com. Retrieved May 5, 2012. ^ Chitwood, Scott (October 10, 2011). "Green Lantern: Extended Cut Blu-ray review". Superhero Hype. Retrieved May 12, 2012. ^ Frankel, Daniel (June 19, 2011). "'Green Lantern' comes up short at box office". MSN. Retrieved October 14, 2011. and another $100 million to promote it. ^ Raub, Matt (November 15, 2010). "First Footage of 'Green Lantern' Hits the Web". The Flick Cast. Archived from the original on July 5, 2011. Retrieved November 15, 2010. ^ "Green Lantern Trailer in November". WorstPreviews.com. October 8, 2010. Archived from the original on July 5, 2011. Retrieved October 14, 2010. ^ "Green Lantern - Movie Trailers - iTunes". Apple. Archived from the original on November 17, 2010. Retrieved November 17, 2010. ^ Fritz, Ben (March 29, 2011). "Warner Bros.' 'Green Lantern' marketing campaign delayed by special-effects work". Los Angeles Times. Archived from the original on July 5, 2011. Retrieved March 30, 2011. ^ Fritz, Ben (April 2, 2011). "'Green Lantern' Footage Wows at WonderCon". The Hollywood Reporter. Archived from the original on July 5, 2011. Retrieved April 4, 2011. ^ "Green Lantern animated movie?". Comics Continuum. March 18, 2010. Archived from the original on July 5, 2011. Retrieved March 22, 2010. ^ "Come Think With Us - Think Mcfly Think - Exclusive Interview With Bruce Timm". Thinkmcflythink.squarespace.com. April 25, 2010. Archived from the original on July 5, 2011. Retrieved July 16, 2010. ^ Marnell, Blair (June 30, 2010). "'Green Lantern: Emerald Knights' Animated Movie On The Way?". MTV News. Archived from the original on July 5, 2011. Retrieved July 19, 2010. ^ "Green Lantern Movie Prequel Comics". DC Web Store. Retrieved December 15, 2013. ^ MacDonald, Brady (October 19, 2010). "Six Flags Magic Mountain aims to reclaim coaster crown with Green Lantern in 2011". LA Times. Archived from the original on July 5, 2011. Retrieved October 24, 2010. ^ "Warner Bros. Interactive Entertainment Announces Green Lantern: Rise of the Manhunters as Its Debut Nintendo 3DS Title". DC Comics press release. May 25, 2011. Archived from the original on July 5, 2011. Retrieved June 28, 2011. ^ McClintock, Pamela (June 17, 2011). "Box Office Report: 'Green Lantern' Earns $3.4 Million in Midnight Runs". The Hollywood Reporter. Archived from the original on July 5, 2011. Retrieved June 20, 2011. ^ Gray, Brandon (June 20, 2011). "Weekend Report: 'Green Lantern' Not the Brightest Bulb". Box Office Mojo. Archived from the original on July 5, 2011. Retrieved June 27, 2011. ^ "Summer bummer: 5 most disappointing movies". Today.msnbc.msn.com. Retrieved May 5, 2012. ^ Paul Thompson (September 5, 2011). "Summer of flops: How A-list stars failed to save Hollywood from more box office disappointment". Daily Mail. Retrieved May 5, 2012. ^ "Gobble Gobble: The Biggest Box-Office Turkeys of 2011". The Wrap. November 22, 2011. Retrieved November 26, 2011. ^ McClintock, Pamela. "Movie Report Card: 10 Biggest Flops of 2011 (So Far)". The Hollywood Reporter. Retrieved September 17, 2011. ^ "Green Lantern". Rotten Tomatoes. Flixster. Retrieved March 31, 2013. ^ "Green Lantern". Metacritic. CBS Interactive. Archived from the original on July 5, 2011. Retrieved June 17, 2011. ^ Pamela McClintock (June 18, 2011). "Green Lantern' Fares Better with Fans Than Critics". Hollywood Reporter. ^ Chang, Justin (June 15, 2011). "Green Lantern". Variety. Archived from the original on July 5, 2011. Retrieved June 15, 2011. ^ Dargis, Manohla (June 16, 2011). "It's Not Easy Being ... You Know". The New York Times. Retrieved June 16, 2011. ^ Lemire, Christy (June 15, 2011). "Review: 'Green Lantern' Is Pretty Dull and Dim". Associated Press. Archived from the original on July 6, 2011. Retrieved June 16, 2011. ^ Ebert, Roger (June 16, 2011). "Green Lantern". Chicago Sun-Times. Archived from the original on July 6, 2011. Retrieved June 16, 2011. ^ "Ten worst films of 2011". The Daily Telegraph. London. December 15, 2011. Retrieved December 17, 2011. ^ McCarthy, Todd (June 15, 2011). "Green Lantern: Film Review". The Hollywood Reporter. Archived from the original on July 6, 2011. Retrieved June 15, 2011. ^ Maltin, Leonard (June 17, 2011). "movie review: Green Lantern". indieWire. Archived from the original on July 21, 2011. ^ Turan, Kenneth (June 16, 2011). "Movie Review: 'Green Lantern'". Los Angeles Times. Archived from the original on July 6, 2011. Retrieved June 16, 2011. ^ BrentJS (October 17, 2010). "Green Lantern Wins "Most Anticipated Movie" at Scream Awards". Reelz Channel. Archived from the original on July 6, 2011. Retrieved November 28, 2010. ^ "Scream 2011". Spike TV. Archived from the original on September 23, 2011. Retrieved September 7, 2011. ^ "Nominations Announced for 2012 People's Choice Awards on CBS". Tv.broadwayworld.com. Retrieved May 5, 2012. ^ McNary, Dave (August 9, 2010). "Goldenberg lights 'Lantern 2'". Variety. Archived from the original on July 6, 2011. Retrieved August 9, 2010. ^ McClintock, Pamela (June 26, 2011). "Warner Bros. To Pursue 'Green Lantern' Sequel". The Hollywood Reporter. Archived from the original on June 28, 2011. Retrieved June 26, 2011. CS1 maint: BOT: original-url status unknown (link). .
^ Nakashima, Ryan (September 17, 2011). "Hollywood balks at big budget movies as DVDs drop". Yahoo!. Associated Press. Archived from the original on September 24, 2011. Retrieved September 17, 2011. ^ "David Goyer Tells Me How Man Of Steel Will "Cause" The Justice League Movie". Bleeding Cool Comic Book, Movie, TV News. Retrieved October 5, 2014. ^ McGloin, Matt (December 5, 2015). "WB SHOWS OFF GREEN LANTERN CORPS CONCEPT ART AGAIN FEATURING HAL JORDAN & JOHN STEWART". Cosmic Book News. ^ Vieira, Anthony (December 5, 2015). "Green Lantern Corps Concept Art Showed Hal Jordan & John Stewart". Screen Rant. ^ Fleming, Jr, Mike (January 12, 2017). "Warner Bros Sets David Goyer, Justin Rhodes For 'Green Lantern Corps'". Deadline. ^ "The Self-Deprecating Ending of 'Deadpool 2' Is the Funniest Part of the Movie". Thrillist. May 17, 2018. ^ "Teen Titans Go! to the Movies TV Spot Takes a Shot at the Green Lantern Film". CBR.com. March 24, 2018. Wikimedia Commons has media related to Green Lantern (film).